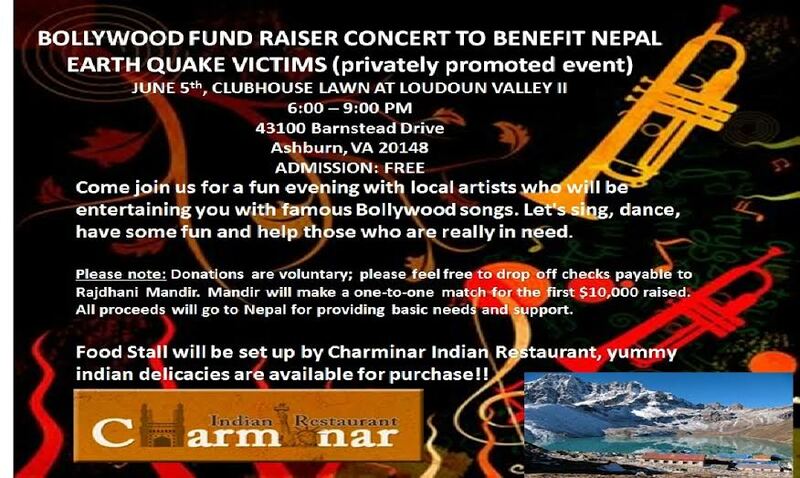 First of all a big thank you to Deepa, one of my regular readers, and all the organisers for organizing a fund raiser concert in Ashburn, Virginia for Nepal Earth Quake Victims. If you are anywhere near Ashburn, VA on 5th June 2015, please go and support the event. It will be a fun night with lots of songs and dances by local artists. Admission is free but please be generous and donate for a good cause. Rajdhani Mandir will make a one to one match for the first $10,000 raised. All proceeds will go to earthquake victims of Nepal and believe me every penny counts. Thank you everyone once again. This entry was posted in Kathmandu, Nepal and tagged 7.9 magnitude earthquake, Ashburn, donate, donate for earthquake in nepal, donate for nepal, earthquake, earthquake in nepal, help, kathmandu, Nepal, Nepal Earth Quake Victims, please donate, please help, pray for nepal, VA, Virginia. Bookmark the permalink. Guess what? We were able to raise $2200, the mandir is making a 100% match, so it is $4400 :). The turnout was fantastic. What a great news. Thank you Deepa and every one who was involved to make it happen. Big thank to Mandir as well. You guys are awesome. Thank you so much!! We want to try to raise as much as we can and send them over to our Nepal brothers and sisters.